It was the middle of the night and I had not fallen asleep yet. The fearful airport entry had gone well...we were not pulled aside or questioned as we entered the country and completed customs. But on the first night out exploring the city, our workers (missionaries) had suspicions that we had been followed by secret police, which obviously had shaken each of us a bit. The question remained: How to film in a country where security issues loomed large? I tossed and turned. The Adhan can be heard throughout the city, with no way to escape its dark and eerie echo. I had come here to tell the story of our workers and yet I couldn’t recall the promises of our Brother (the name for Christ I was to use in any communication with loved ones back home). I wrote down memories from the day to send to friends that were back home praying for me. I would find out later that some of them had been praying together at the very hour the adhan was proclaimed over the city. I just wanted to sleep. The next day would be full as we would be traveling to a refugee outreach and, for me, meeting Syrian refugees for the first time. In my exhaustion I couldn't bring myself to ask anything of our Brother. “God is greatest. God is greatest,” the Imam continued. "When I am afraid, I put my trust in you. In God, whose word I praise, in God I trust; I shall not be afraid. What can flesh do to me? You have kept count of my tossings; put my tears in your bottle. Are they not in your book? Then my enemies will turn back in the day when I call. This I know, that God is for me. In God, whose word I praise, in the Lord, whose word I praise, in God I trust; I shall not be afraid. He remembers our tossings. He knows how many times I tossed and turned that night as I was full of anxiety and fear. We would hear the Adhan more than twenty five times during our time in the Middle East and I never got used to it. A chilling echo over a city gripped by restrictions which keep many from hearing the name of our true Christ. I left the Middle East more thankful and moved by a God who not only keeps count of my tossings but His same book tells me He gives to His beloved sleep, all reminders to trust Him and not fear. Pray for our missionaries in closed countries around the world…that they would know God loves them so deeply that He keeps track of their tossings and catches their tears in a bottle. Pray they would know He is at work in dark places. And in the midst of fears, anxieties, and persecution that you and I quite frankly can't understand, pray that God would give them sleep. • Trips in 2018: Pray as we are in communication with folks "in the field" to determine where and when I'll be documenting different teams in 2018. Pray for our communication with teams and for plans, schedules, and logistics to work out to go where God is leading for 2018. • Church visits: Pray for opportunities to share at more churches and new outlets to speak about missions in order to encourage the American church, advocate on behalf of our missionaries, and raise support for this ministry. • Support Raising: Pray for God to provide the remaining yearly support needed and for the account to stay healthy for future years as we plan trips and storytelling for next year and beyond. • Editing Challenges: I am editing sensitive videos I filmed from the Middle East in 2017. These present challenges and require a different approach. Please pray for safety and encouragement for our missionaries appearing in these films and for God to call long-term workers to the Middle East. • Spiritually/Physically: These trips can be challenging emotionally, spiritually & physically as I go back and forth to the field. Please pray for Christ's power to be made perfect in my weakness and for rest in the midst of seasons of long work hours and trips away from home. 2017: A Year in Review! This year was one of major transitions for me in a lot of ways! From finishing up videos from 2016 to presenting at churches, to serving on our pastor search committee, to my first project in a closed country, to going full time with Mission to the World, God has brought me through many doors and taken me to unexpected places. You have been a huge part of this year especially in these specific transitions. Your prayers, support, and encouragement have made another year possible. I'm thankful for the ways God uses you each year to remind me that we were not meant to do things alone, big or small. Celebrate with me another wonderful year of God's faithfulness in this ministry. Much of the beginning of the year was spent finishing up films from a very busy 2016! I got to spend almost 6 months in the US in early 2017 and I spent much of that time playing catch up not just on films but on rest as well! God used that time to allow me to finish films before starting new projects, establish new friendships, serve in a sustained way on our pastor search committee for South Baton Rouge Pres. in our first few months of getting the committee going, and go on restful trips with friends! It was time that I didn't know I needed and I learned a lot from it. In the spring of this year ByFaith Magazine did an article on MTW and the PCA's response to the global refugee crisis. They used photos from my time on the docks of Greece in Athens in March 2016 as refugees from Syria and neighboring countries arrived on the shores of Greece fleeing war and persecution. This was another way that God used the photographs and videos of the refugees we've worked with in the last 2 years to bring more understanding and awareness of the ways God is making His name known amongst the nations. The film on the refugee crisis that I made from time in Greece and Germany in order to educate and call the church to support our missionaries involved in planting churches amongst refugees was shown at this year's General Assembly for the Presbyterian Church in America. We received a lot of encouraging feedback from those who saw the film and continue to pray that God uses them to encourage others to pray, give, and go to serve amongst refugees around the world. We expanded this ministry to also entail my sharing at more churches throughout the year about what God is doing in other places. We saw multiple missionaries gain financial support, prayer partners, and encouragement from stories shared at churches in the last two years. Now my job with MTW is also to be a kind of advocate for our missionaries abroad and to seek new ways and places to get these stories in front of the American church. Please pray for more opportunities and places to speak in the coming months and years. I went full time with MTW! We increased my responsibilities with MTW and the amount of videos we'll produce each year as well as added some responsibilities with our marketing department and increased the Communications Arts Initiative budget for future years.Thanks to the support of many individuals and churches God provided a way to go full time with MTW which is a dream come true. I am still raising support and have about 10% left to raise to be fully funded for 2018. Please pray that God would provide the final funds needed to do this work full time! Trip to Middle East and closed country. In August, I got to work with some of our workers in the Middle East for the first time in a closed country. Since I started documenting stories of Syrian refugees hearing of Christ and getting involved in church plants in Greece & Germany after fleeing their home countries, I have longed to be able to get even closer to the crisis and learn even more about the suffering, culture, traditions, and beliefs of those God is bringing out of the Middle East and into countries where they can hear the gospel for the first time. I got to do that in an unexpected way this year and the trip changed me in many ways. I learned about missionaries all over the world living under threat of deportation or worse all for the sake of the gospel. I also learned more about the war in Syria, why people had to flee, and their beliefs which have helped me understand those we've served and will serve for years to come. Stay tuned for more stories from the Middle East and videos from my time there and please pray for the production of these videos over the next few weeks. I got to experience an unexpected reunion at the PCA's Global Missions Conference this year! I ran into friends I served with in Greece, Washington State, Canada, the Middle East, and Germany among other places. It was a little taste of heaven to reunite with brothers and sisters serving around the world and to hear from them how God has used the videos we made from our time with them and their ministries over the years. This photo is of me with Tim and Alex who have planted a church in an anarchist neighborhood in Athens, Greece. They are also doing refugee outreach and made a point to tell me at the conference how God has used the videos we made of their ministry in Greece to increase their work and support. It was a special time of remembering all God has done and an encouragement to press on! In September, I traveled to Ukraine in order to document stories of community transformation amongst Ukrainians after the Soviet Union collapsed. The story of Masha and her mother, Olena, coming to Christ through English classes led by MTW missionaries was shown at the GMC conference in Dallas in November this year. Thousands of people got to hear of God's work through workers in Ukraine and other places and hear the call to support and pray for missionaries around the world through this conference. It was an honor and encouragement to see God use these films in that way. This season marks 3 years working with MTW as photographer and videographer for the Communications Arts Initiative and marketing department. There are many days where I have to pinch myself from unbelief at what God has done in providing this ministry and calling me to be a part of it. In the fall of 2014, the marketing department created this position in order to provide these stories of what God is doing all over the world and I am continually encouraged by the places He's taken us since then. This photo is from my first project and trip with MTW to Cambodia in January 2015. This ministry is made possible by you and the work, prayers, support, gifts, time, questions, letters, phone calls, texts, coffee dates, and friendship He's provided in this team. I am so grateful. Here's to a wonderful 2017 and exciting days ahead in 2018. "the worst thing that can happen in this process is God teaches you he wants you in a different place." It was a particular statement about fear and calling to ministry that I had not heard said in that way. Doug was saying that God uses even the seemingly "wrong turns" to guide us. As I reflect on advent and finish up another year, I’m reminded that God takes our decisions, our weaknesses, our doubts, our frustrations, our fears and in the midst of them, He guides. I’m reminded that on the hardest of days God will use it to show us where we’re going. And where are we going? The season of advent reminds us as we wait expectantly for the coming of our Lord. You who bring good news to Zion, go up on a high mountain. You who bring good news to Jerusalem, lift up your voice with a shout,lift it up, do not be afraid; say to the towns of Judah, “Here is your God!" Thank you for making it possible to tell the stories of those who “bring good news to Zion" and say to the nations "here is your God!” May we celebrate this advent season, the one who carries us close to His heart and gently leads us. To hear more from Doug and see his video on calling (that I did, by God’s grace, finish on time!) that was shown at the PCA Global Missions Conference, click the image above. The MTW Ukraine team in L'viv have a meeting about an annual English camp that has been the catalyst for many conversions in Ukraine including that of a couple of women who now serve on their team. 2. Church visits: opportunities to share at more churches, connections to new congregations and outlets to speak about missions in order to encourage the American church, advocate on behalf of our missionaries, and raise support for this ministry. 3. Support Raising: support raising for yearly support needed and for the account to stay healthy for future years as we plan trips and stories for next year and beyond. Many thanks to InRegister Magazine for featuring and publishing some photos from my trip to Cambodia. 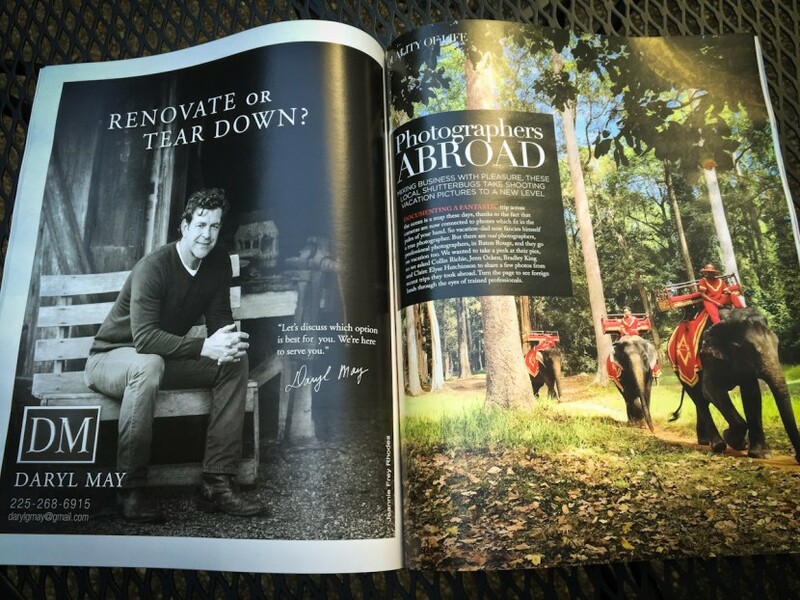 It's an honor to be included alongside some of Louisiana's finest photographers. Check out the article on their website here and if you're in South Louisiana go grab you one! Return to Rwanda Benefit Show...This Friday!! The time is here! As you know, I’ve been talking about Betsie and her work in Rwanda for quite some time now! Kate and I got to go to Kigali, Rwanda in March to photograph and film the work Betsie has been doing for over a year. She works alongside 15 women, teaches them to sew, teaches them about work, and runs a sewing cooperative ( Umucyo) so that they can have sustainable income! Here’s where you come in. THIS Friday (October 17th) we’re having a fundraising event in order to raise the remaining funds Betsie needs to Return to Rwanda! This is an incredible opportunity to be a huge part of helping women half way across the world. There will be food, music, a silent auction, and Betsie herself there to talk about her work in Rwanda and answer any and all questions folks may have. We’ll also show the video that I made from our time with the women and the co-op back in March. This will be such a fun evening for such a great cause. Don’t miss it and let me know if you have questions!! Hope to see you there:). Want a sneak peek of the video we made for Betsie’s fundraiser? Check it out at this link! What time? : 6:00 pm-10:00 pm. How much? : $10 cover which includes a jambalaya meal (Kids eat for free!!). Be sure to bring extra cash for the silent auction & giving to Return to Rwanda! Why? : So that 15 women who once were refugees, once lost all they had, once lost their entire families, and otherwise would not have an income can continue the work they do to provide for their families. So that you can make a huge impact on one little corner of the world..Kigali, Rwanda! Have questions? Email us (claire@claireelysephotography.com) text or call me (225.715.7229) any time! For one day while in Rwanda, Kate and I got to go outside the city to the Muhanga District where we spent the day with 7 women who are artisans with another co-op, Ingobokarugo Cooperative, in Rwanda. They make baskets and jewelry that they then sell through Azizi Life who sells their items to folks in the UK and the states. Through purchases of these items, the women are able to earn an income for their families, provide a way for their children to go to school, and contribute in other ways to their household. These women opened up their home and time to us to show us what a day in their life looks like. We did everything from hoe in the field to carrying the cow’s lunch on our heads, to preparing their one meal of the day to learning how to make the jewelry they make ourselves! This was an extremely eye opening experience. I saw families and children who live completely on the land…and there’s a joy that I couldn’t explain. These people are living in what to us here in the states would be seen as some of the most impoverished situations. But they have everything they need…and then some. In these communities, the families and neighbors share everything. When it’s time to kill the pig or cow…it’s shared with the entire community. When someone needs a house..all the men in the community come together to make the mud bricks and build the home. This mentality and way of life is fundamentally different from so many other cultures in the world. This is also what made the genocide and the murder of neighbors by neighbors an all the more shocking reality. Something happened that day that I will never forget...As we were leaving the families including all of their children sang and danced for us. While dancing their traditional tribal dance, they were thanking us for being a part of their lives for the day. They don’t know us…they definitely don’t understand us and yet they were so welcoming…they then asked us to sing and dance for them. We of course weren't prepared and even laughed at first. But then we decided to sing Amazing Grace. They had never heard the song and it was a very moving experience. We began to get emotional singing it and had a hard time getting through the song. It occurred to each of us while singing about grace and eternity to those who don't even speak the same language that one day we will all sing together. We will worship and sing praises to God with members of God's family literally from every tribe and every nation..
when we've been there ten thousand years.. The kids in the villages all run to the street when they hear a car coming. They don’t see cars very often so when one pulls up they drop everything and run after it…waving and often yelling “mzungu!” which means “white person!” The photos of the kids and families doing this are some that I will treasure forever. The experience of that joy and welcome given to strangers was the gospel being played out. There is something in all of us...something that is not of us and it is God’s work to restore chaos in a broken world. Out of this chaos is a redemption that can be felt in the smiles, the dances, the hugs, the claps of even those who don’t even know the same language as us…and even in the car chases by children so excited to see someone different from them…there is a hint..a whisper of God’s grace, goodness, generosity, and joy that is real and that being in this world we have the privilege to share with others. And if you're ever in or near Rwanda, go visit Azizi Life and spend a day in the life of these people. You'll be changed forever. Back again from photographing in Kigali. Now, don’t get me wrong. I’m not knocking large buildings and anyone who knows me knows I wouldn’t knock just about anything on LSU’s campus as it quickly became a second home to me during my time there. (Not to mention it’s the most wonderful campus and school there is but I digress). The point is….when I go to other countries... developing, third world countries….when I see how, honestly, the majority of the world outside of America lives...when I experience the immediate slowing of time, priorities, values, and status... when I see hurting or see the effective way that other cultures live…I have a hard time coming back to the states. The states and western culture are fast-paced in a way I can’t really describe. The emphasis on success, money, fame and finding oneself is so overwhelmingly preached in every aspect of our culture that I have to be honest and say that it takes quite a few days to jump back in..and to fight a confusing cynicism. Last week I spent a few days in Africa. I spent time with a group of 12 women at a little co-op in its own corner of Kigali, Rwanda. I saw a work ethic much like, yet so different from ours in the states in order to provide for families that had been ripped apart by war-torn nearby countries and by Rwanda’s own experience with genocide 20 years ago. I experienced confusion in trying to not only communicate with those in the culture, but understand the differences in them and in our life experiences. I spent the day with women in mud huts who live off the land, have no idea what time it is throughout the day, and who I could bet have never seen a building as tall as LSU’s Memorial Tower. I experienced all these things and how do I feel now?...more confused than when I left! I feel more closely now the frustrations that there are millions out there who suffer every day. More than ever I am angry that poverty exists, uncertain why God put me where I am with what I have, and more joyful than I could have expected that he truly does comfort and care for his people. I could sit here and write about all the things that I learned…and I will :)….or act like I understand why cultures are the way they are and what goes into them…or even pretend to define one as better than the other. The truth is…it’s times like this that the only definition or label I can put on any of it is that I only know a tiny fraction of how God is at work in this world, what he’s doing to “make all things new,” and the way that sin has complicated all of it. I don’t have all or even many of the answers and I so easily feel the effects of that when I try to jump back into our culture or as I attempt to answer others’ questions about my trip and time in these places. I don’t know how to answer many questions…but I am going to attempt to tell whatever stories God has for me to tell through my time there and anywhere else he takes me. Hopefully throughout the process whoever reads this will learn a few things about what God is doing in their own lives, understand the world a little better, and maybe even purchase some items made by folks on the other side of the world who because of reasons we can't know will never know life like we experience here. For the next couple of weeks I will post once a week on our time in Africa, the people we met, the stories we heard, the joys and struggles that I or those I love experience there, and how you can help. This is not to pretend I have answers or to condemn our own culture or where God has each of us. It’s in order to answer the call to speak about the only one who has the answers and what he’s, for whatever reason, sent me in the world to do for such a time as this. So if you think to, please stay tuned and return to see photos and stories. This as always is a process full of uncertainty and more questions asked with every perceived answer. What a joy to have been given the freedom and invitation to ask. The editing for all the Haiti photos is coming to a close. I still have more photos and stories to share, but was reminded this morning of a moment I've told folks about but didn't realize I got a photo of. One of our final days in Port au Prince we took food to some people who live in the street next to the iconic Cathedral that was all but destroyed in the earthquake that hit Port au Prince in January 2010. I was able to look inside one of the "homes" people have made and saw a tarp for shelter, broken down boxes for beds, and two jugs for water. This is all they had. I'm thankful to have a photo of it..I didn't even realize I had taken one from afar. I'm thankful to have a reminder that God's grace has been given in ways I don't even think about from day to day but not because of anything I've done. I need this grace just as much as those living in tents and just as this grace was undeservedly given to me, it's possible for them as well. It's good on this Friday to remember that the boys and girls we came to love in Port au Prince at Zanfan Lakay, the home for children of the street, no longer live with just a tent, cot, and the clothes on their back. They now, by the grace of God and the gifts of people in the states, have a home, new family, shoes, clothes, some of them even education, and all of them the chance to hear of this grace on a regular basis. I’ve mentioned a few times already the boys home we worked with which was our main connection to working in Port au Prince. The home is named “Zanfan Lakay” which means “children at home” or “home for children.” Before I show you images of these boys, and girls, I’d like to tell you and show you a little from where some of them came. You've already heard Naika's story and the ways God is using Zanfan to provide for her in tangible ways. Each of these children have a different story…but all are orphans. How they came to Zanfan Lakay or were taken there is an array of backgrounds and stories. The first members of Zanfan Lakay lived on the street. Some of them for 3 years in a place called Zakat. This area is close to a sewer where many folks live. We had the privilege of visiting Zakat and seeing where these boys lived for months and years before God provided a home, food, shelter, shoes, and clothing for them. The following images are of Zakat & the room the boys lived in, some of the boys who lived there the longest, and our team feeding some of the people who are still living in the area & on the street. Jimmy's wife, and Zanfan Lakay's house mother died unexpectedly this year. They are currently in a major transition and grieving a huge loss of their loved one and for the home. After having to find a new house because of a spike in rent, the children have recently moved to a new area of town which means new schools and new adjustments. The hope is that Grangou will be able to eventually purchase the home the boys just moved into. Please pray God's work through Grangou and Zanfan Lakay as well as the teams that regularly visit would expand to other needs in Port au Prince and continually bring good news to each of them. Check out a photo of Zanfan Lakay's new house here!! The story of why and how we went to Haiti can be found on these previous posts here and here. On our first full day in Port au Prince, we had the opportunity to visit a local pastor and his family who had recently decided to take in and care for 6 special needs children. This family, the Darres, lived in the heart of the city, and had very few resources to care for their own family, let alone for 6 new children who required extra attention. Yet, they had a heart for serving these children, and the faith to trust that God would provide what they needed. My aunt, Kandis- the physical therapist from Texas, had held a clinic for 40 special needs children at the home of this family before and had warned us that when we got to their home, we might see some things that made us feel uncomfortable, so I tried to be prepared for what we were about to experience. he loved them very much. After speaking to the man, we peered into the dark, window-less room where the children were liying on the concrete floor on tattered mats. Kandis told us our only job was to go inside and love on them, hold them, laugh with them, play with them. And we were happy to do whatever we could. The temperature in the concrete room was well over 100 degrees and several children had very high fevers. As I sat down on the floor and began to fan flies off the face of a two year old boy with cerebral palsy, I was overwhelmed with anger and frustration. He was crying out and obviously in severe pain and discomfort, but there was very little I could do to make him feel better. In that moment, I was so mad at the brokenness and fragility of this tent of a body that we carry around with us, disgusted with the lack of medical care available to people in these circumstances, angry at the ugly mark that sin has left on this earth. At the same time, I thought about every time I obsessed about my body or appearance, every time I griped about a “first world pain”, every time I neglected to show patience and mercy in a situation where someone was desperately crying out for help. As I continued to hold this sweet boy, doing anything I could to communicate that someone was right there with him, God hit me over the head with a complete feeling of helplessness. As someone who (most days) feels like “if I just work harder, maybe tomorrow I’ll have it all together” or “I-can-take-care-of-myself-thank-you-very-much” , I have a hard time grasping the extent of God’s provision for me. But through this experience at the Darres' home, I envisioned myself and my circumstances through the eyes of this child- unable to do anything for himself, completely dependent on the mercy of someone else to provide for his every need. Without someone-his nanny, his caretakers, a volunteer-coming in to stoop down, pick him up, and take him outside to experience the sunshine, he would always lie on the floor alone. But God always provides exactly what we need. And for this boy, and every other child at the Darres home that day, God provided wheelchairs. These wheelchairs, which are worth close to $10,000, were donated by people in the United States who knew that my aunt takes them to people in Haiti. She doesn’t bring the wheelchairs with any specific person in mind, but inevitably, they always fit someone who needs them. That day at the Darres, my new friend was picked up off the floor and put in his very own wheelchair. This provided almost immediate relief from a lot of the pain he was experiencing, opening up his lungs and allowing him to breathe more easily than he could on the floor. Even though he will never run or walk, he also will never spend every moment of his life lying on the floor. God lavished His grace on these children through the gift of a new, better way of living and experiencing the world. Praise God that He graciously gives that same gift to all His children. If I'm honest, this was one of the hardest things to photograph while we were there. Sorrow and joy were both very real at the same time. I would say these photos accurately portray the many ups and downs of the week and encouragement that came in the midst of grieving. It's hard for me even to post these photographs as we saw these children living in what I can only describe as the worst of circumstances I had seen at that point...but oddly enough...they're better off at this home on this hot floor than in the tent cities where they came from...more on that soon. If you or someone you know has access to wheelchairs or medication to be taken to Haiti on future trips please email me (hello@claireelysephotography.com) or comment below. Check out our connection to Haiti and the group of boys we went to serve here. While in Haiti we did several different things throughout the week and got to servein multiple ways. Today, I’d like to talk about one of the many things we got to be a part of and our original connection to the opportunity to go. So, Kate, my dearest friend and roommate, who is now a continuous help on wedding days and practically partner in this business, has a lot of family that have loved me as well as she has over the years. One part of this family that feels like my own is her aunt in Texas. Kandis is a physical therapist who works with special needs children in a school district right outside of Houston. She originally found out about Grangou’s work in Haiti through her own church. (more on Grangou and what they specifically do through the boys’ home we partnered with in Haiti is coming). For the past few years, Kandis has been taking wheelchairs to Port au Prince and providing assistance for special needs kids. I’m going to pause my story here in order to give a shout out to American Airlines. A couple of days before we left, Kandis’s husband, Steve, went to talk to American Airlines about our flight. At this point Kandis had collected 7 wheelchairs and a gait trainer from current clients who didn’t use these particular chairs anymore as donations for her to take to those who need them in Haiti. We also wanted to take 6 checked bags full of clothes and medical supplies which was a priority since shipping these items is pretty much impossible (they will likely be stolen before getting to the right folks). So Steve went to talk to American Airlines about all these bags and wheel chairs. The guys at the counter remembered Kandis and her many trips with wheelchairs and Steve showed them pictures of some of the kids she goes to visit. American Airlines decided to let us check all the wheelchairs, gait trainer, and 6 bags..for free!!! Since starting a business, I tend to get super excited when I see people run their businesses well. I know many people have issues with just about every airline out there as traveling has sometimes become a nightmare for folks so really I couldn’t believe they let us do this. That’s kind of a big deal these days. It was a very redeeming and hopeful report in my mind and so I think American Airlines could use a shout out. So…Monday morning we trekked to the airport, trailer in tow, with 7 wheelchairs, a gait trainer, and 6 huge bags full of belongings of our church members and medical supplies our friends had donated to people they didn’t know. It was a pretty awesome sight and the first of many humbling moments on our trip. When we arrived in Port au Prince after a very long day of travel, getting initiated right off the bat into the very different culture of Haiti simply by arriving at the airport, waiting…and waiting…and waiting some more…we met our team and had dinner at the hotel. While visiting with team members we were told in passing about Naika, a little girl who had recently been taken in at Zanfan Lakay, the street boys’ home we would be working with. Naika couldn’t walk. She had to be carried to get anywhere and held sometimes by multiple people in order to do any basic tasks you and I take for granted every day. With Naika’s condition, most children in the US would have the resources and therapy to be walking by her age. Naika is originally from the cemetery where many men and women live within the walls and amongst the graves. I had heard of people living in the cemetery all throughout the trip but it wasn’t until we got back that I found out what these women live in. There is a cemetery in Port au Prince that has 24/7 guard service within its gates. There are women within the gates of the cemetery who have been allowed to live there and given “protection” by the guards in exchange for prostitution and “servicing” the guards on a regular basis. These women live in the cemetery, are abused and used by the guards, and often become pregnant without a way to care for their child. Naika became a part of Zanfan Lakay, the boys' home, because, Jimmy, the house dad at the home regularly takes food and clothing to the women within the gates. Naika was likely born with cerebral palsy and there was no one to accurately care for her within the gates, so Jimmy took her in. I mentioned a gait trainer was donated to Kandis before we left. The thing about these wheelchairs and supplies Kandis gets is she takes whatever folks can give and doesn’t really know who in Haiti will need them, what size these folks are or what size their chair would need to be. She just takes what people give and sees how she can use them when she arrives. This trip was the first time she was given a gait trainer to take to Haiti. A gait trainer is basically a walker which is used for children who have cerebral palsy or other issues walking or using their legs. In the U.S., if a child with cerebral palsy is given the care they need from a physical therapist, the child can learn to walk with a trainer and even get to the point where they are able to walk on their own. Again, Kandis hadn’t heard of anyone in Haiti that she knew would need a gait trainer, but brought it anyway knowing we would likely find a use for it. God provided the trainer for Naika long before Kandis or our team knew about Naika’s need for it. The following photographs are of the first time Naika walked. This happened our first day in Haiti. With all of the boys and girls from the home and our entire teamwatching, Kandis stretched Naika’s legs, stood her up, and then put her in the gait trainer. At first Kandis helped her get acquainted with the device and helped hertake her first few steps…and then the smile that came was full of more joy than I think I’ve ever seen in a smile as Naika began to do it on her own. Her face had suchan expression of redemption and hope. It was the first of many reminders that God is at work amongst these people, that he saves the lost, that he came for the poor and broken, and that he literally causes the lame to walk. The next day, Naika walked the length of the front patio area by herself. She even got to watch a video of herself walking on her own. Throughout the remainder of the trip, Kandis was able to give all 7 wheelchairs to those who needed them and purchase an additional chair for a man who lives in a tent city where we delivered food throughout the week. More on those who received the other chairs and how God used our time there will be in later posts and stories. If you know of a way to donate wheelchairs or funds to purchase supplies and medication needed to treat children like Naika or if you want to learn more about how you can sponsor one of the boys or girls at Zanfan Lakay, please comment or email me (hello@claireelysephotography.com) or visit Grangou’s website here. I’m going to start with a little back story. I explained in my last post some of why I went to Haiti. But it hasn’t been until I returned that I am beginning to understand more why I went. The answers to these questions are answered swiftly, without much forethought, and then followed by other conversation. I think after Haiti, the answers to these questions can’t really stay the same. And I’m thankful for that. Why did I pick up the camera in the first place? I don’t ask this question in a way that assumes I never should have picked up a camera, or that I regret my career choice. It’s more of a little reminder to consider why. And God giving me the opportunity to go to Haiti was that little reminder played out in real life. You see, I picked up a camera years ago as I struggled to know what I wanted to do with my life. Back then I thought I wanted to maybe be a “counselor.” This idea revealed that what I value most is having real conversations with people and serving others. That was the desire in a nutshell. As I’ve gotten older, studied photography in college, shot 3 years of weddings, started life on my own as a single woman out in the world, and had to make a decision of what I will follow, what I’ll live for, and ultimately what my mission will be…the desire to serve others hasn’t changed- it’s just become more focused. The thing is, I originally picked up a camera because I saw that, for whatever reason, God had provided a gift, and a desire to use it and other gifts in order to help. I just haven’t been able to put to words what that “help” actually looks like or means. I've only part known what it means and why I picked up a camera to go, to serve, to use photography and this device that somehow by the grace of God stops His time in its very tracks in order to connect people, to bring awareness, and to bring money, aid, and help from people who, without these photographs, would not know about the need. has concern for or helping to improve the welfare and happiness of people. I’ve thought a lot about this term, this idea and desire I’ve always had, and the comments and ideas of other people who strive to be “humanitarian photographers.” I don’t have it all figured out by any means and I never will, as I’m not the one to know what God has for me now or in the future or why He does what He does…but I’ve been able to realize that long ago God put in me a desire to do something for reasons I may not have been able to put into words, and now He’s given me a little bit deeper understanding than before. I’ve realized that this thing I’m wanting to do with the camera, this aid I’m wanting to bring, this “alleviation of suffering” and desire to “improve the welfare and happiness of people” cannot and will not be separated from the ultimate need and goal of the gospel being that which saves them. I’ve read a lot about bringing dignity to others through photographs. Something I’ve always thought about is somehow using photographs to bring an awareness of people’s conditions and for people to open up their wallets and their time in order to give back after seeing what some people are living in. These are all still missions of mine and ideas I plan to pursue…but the point is..now, more than ever, it’s clear to me that all of these things can’t be separate from a desire to speak the gospel, to make the love of Christ, our need for it, our brokenness, and the grace that came from a man, who wept most of his time here because of the brokenness he saw, that humbled himself in order to go. I can go to other countries and take pictures of people in order to bring dignity to them in the midst of their circumstances, and I can photograph them with a smile instead of a frown in order to show that God made them in his image, and I can stop time in its tracks with this tool that God will likely use to bring money and time and concern from others….but if I do it without bringing the message of the saving grace of the gospel. If I reduce it to “happiness” and “welfare” or even “food” and “clothing” but do not bring the only “alleviation of suffering” there truly is…then what am I doing? This is just an introduction and start of many, many photos I have and plan to show. Please bear with me as I process, in every sense of the word, the photos I was able to take and stick around to see more and hear some of these peoples' stories if you can. Thanks so much for reading, friends.